Snowbird everything from Icey groomers, to crud, to wind buff, to 2 feet of powder. got to ski this ski on wednesday which was a day after a storm day with some new opening. 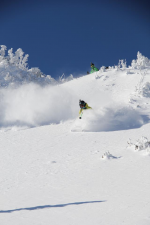 Powder - powder is easy to ski on nearly anything with enough girth and lenght and anything not to stiff. open powder at speed its was almost as stable as my 192cm Thugs but was much easier to turn. the tip rises out of the snow really easy and its kills speed whenever you need to. Its is not as good in tight spot as the Katana but its more than make up for it with its other attributes. Groomer- edge grip in both carved and skidded turns was superb, could be alittle stiff for really short turns on flatter terrain but more pitch make it bendable to any size. Did hurt my knees on hard pack snow, but not as much as my Katana or other wider skis. The simpliest solution to that problem is just to not ski hard pack. Trees/bumps - the skis is alot more nimble than you would think and a couple times it felt as if the ski saved me from certain falls. bottomline - a a great (softer snow)everyday ski for people who 'charge" it will work east or west as long A. you can drive it. B. the snow is just slightly soft. while the 185 appeals to alot of people, this would be my ski to go to at snowbird nearly everyday with just alittle bit of fresh snow. take the above reviews and basically the skis was just easier balance on at higher speeds. I never found a speed limit on this thing, and no amount of chop, or variable snow could upset it. It was slightly more difficult to ski on low angle slopes, but on steeps open and tight quarters it was a joy and actually pretty easy to ski. It was hard to 'ski" bumps but destroying them was quite easy. It was the "honeybadger" of skis, simply put this ski didnt give a crap what was in front of it. Here is a video from the week I got to ski, gives you an idea of the terrain. i was also on 183 cm Katana, and 192cm Thugs, 180cm and 187 Bonafides, and 186cm Bodadicious during the week.